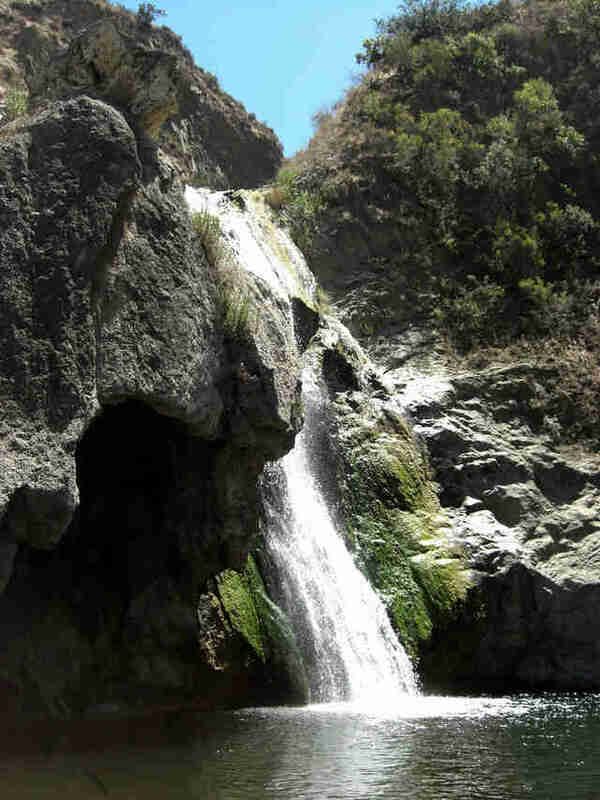 With its canyons, parks, nature preserves, and forests, Los Angeles boasts a ton of hikes, but not many end with the reward of a majestic waterfall (thanks, drought). And since we can all agree there’s something magical about watching a stream of water cascade over rocks, especially after sweating your way there, here are 10 excursions that lead to terrific tumblers, with a difficulty-out-of-five scale for each. Short and sweet is the best way to describe this abbreviated hike to Millard Falls. The trek takes you alongside a picturesque stream that you occasionally do have to cross, but it’s easy enough to bring the kids. At the end, you’ll find a pretty waterfall splashing from a massive boulder -- a rewarding sight considering the mere 1.5 miles it takes to get there. Pro tip: Before you go, look into purchasing an Adventure Pass parking permit, which allows you to park your car in a private lot. Hike less for the exercise and more for the bragging rights? This 2.1-mile nature walk masquerading as a hike is your jam, with a kid-friendly path leading to a modest 30ft waterfall (it’s dried up a bit these days, but there’s still a trickle) and creek. You’ll also find the ruins of the Roberts Ranch House that burned down in a 1982 wildfire -- meaning you get to play Indiana Jones and explore the crumbling remnants of the estate. For a more serious workout, continue onto the Rising Sun and Sosotmo Trails, two slightly more taxing hikes with an ocean view payoff, or the Dry Canyon Trail, which ends in a taller seasonal waterfall. 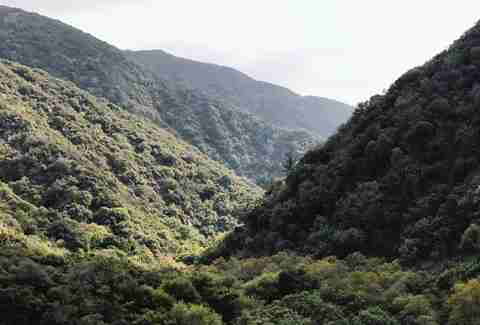 City dwellers yearning for an escape will find it on this picturesque and mostly shaded 3.5-mile hike, starting at the Chantry Flats trailhead in sprawling Angeles National Forest. Along the way, you’ll spot rich foliage, occasional wildlife, and a handful of privately owned rustic cabins nestled in the forest. Be prepared for a few obstacles -- like shallow stream crossings and a hilly incline toward the end -- that make you feel as if you’re in a real-life Super Mario Bros. game. 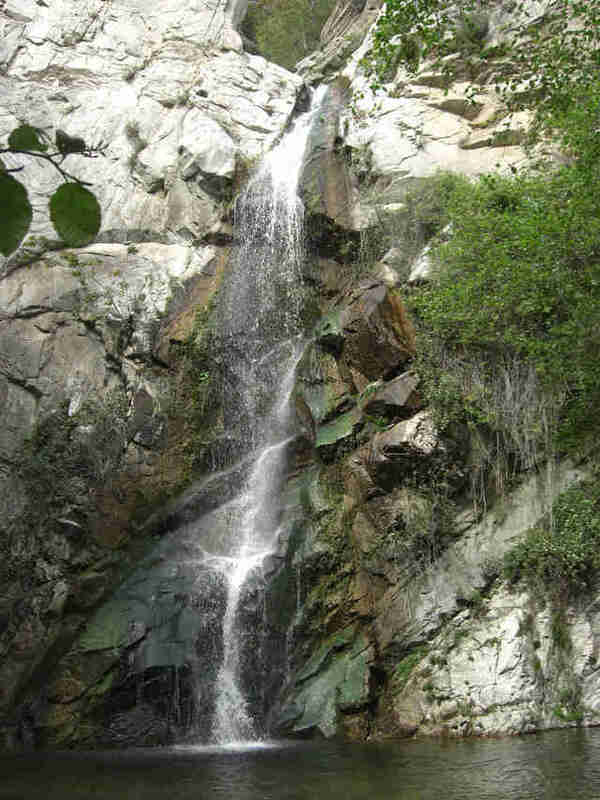 Located just downstream from Sturtevant Falls, this 2.5-mile hike starts in Chantry Flats at the same spot as its neighbor. Though Sturtevant is a longer trek, this one demands a slightly more treacherous journey through a lush canyon; you’ll navigate narrow trails with a sheer drop-off at certain points and handle some rope-climbing action (a must if you want the most scenic views of this 30-foot tumbler). In the summer, watch out for cliff jumpers and swimmers taking advantage of the refreshing swimming hole created by the falls. Just when you think you’ve aced this moderate 3.4-mile hike it does a big 180, switching to rocky, rugged terrain that’s trickier (but admittedly more fun) to navigate. You’ll never be lonely on this trek, which is wildly popular with slow-moving families and dogs on the weekends, so be prepared to share the stunning sight of the 40ft-tall cascade with a crowd of other waterfall-seekers. 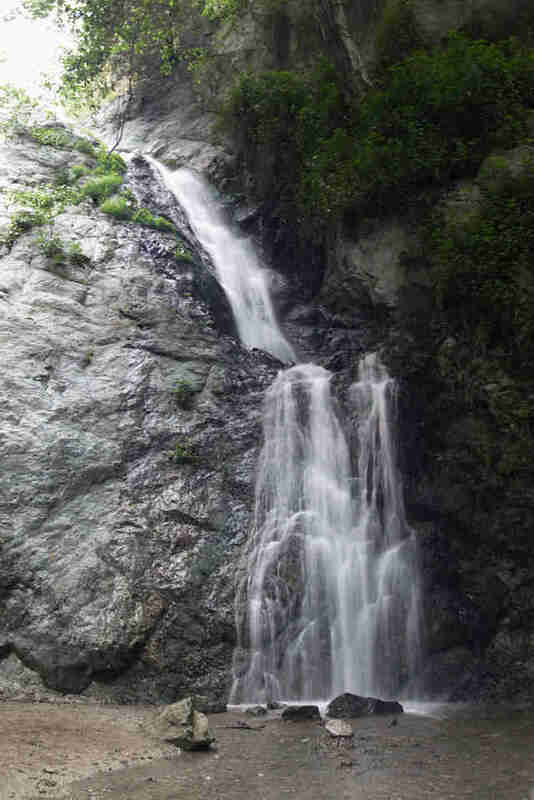 For proof that size doesn’t matter, head to Monrovia Falls. 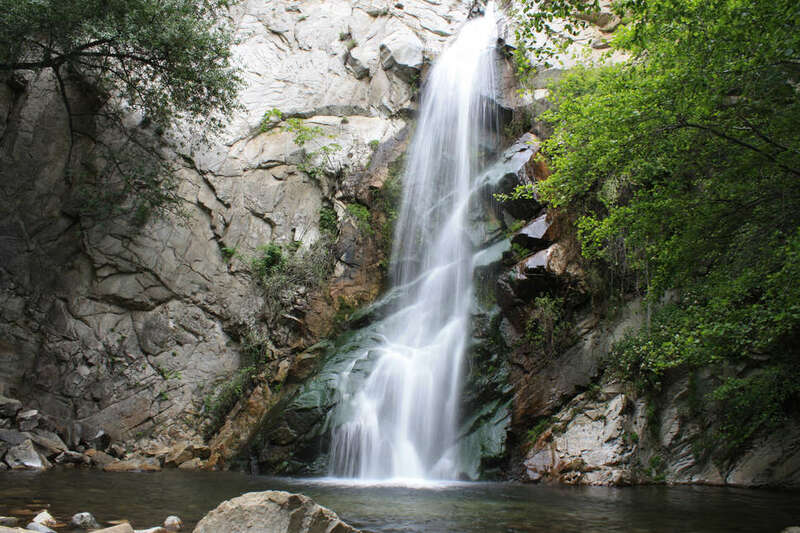 What this 30ft cascade in the San Gabriel Mountains lacks in height, it makes up for in consistency thanks to an underground spring that keeps the water flowing no matter what time of year. That same water source also means verdant foliage flourishes everywhere, providing a shaded canopy (and relief from the sun) along the mostly level, less-than-two-mile trail. 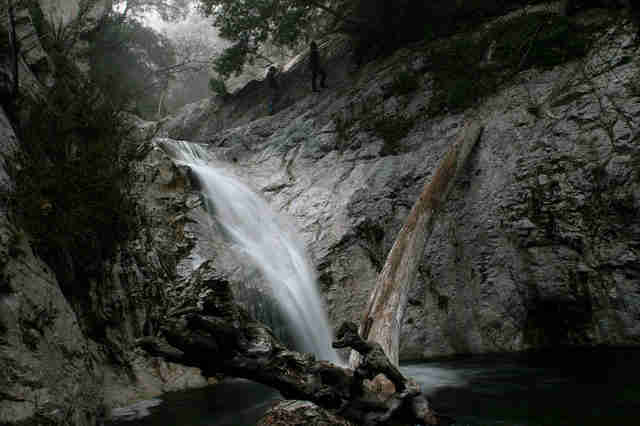 Pro: 40-foot Paradise Falls in Wildwood Regional Park flows impressively year-round, even when it’s not rainy season. Con: Because its source is sewage runoff (yep, gross), the water isn’t clean, so refrain from allowing your dog (or anyone else) to splash around in there. 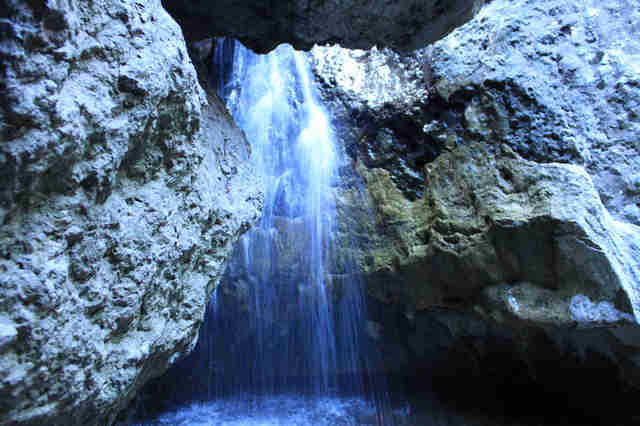 Numerous routes can lead you to the falls, with most trails ranging from a few miles to over four. Though the infamous Station Fire ravaged this area in 2009, the all-levels trail has since reopened and been repaired. 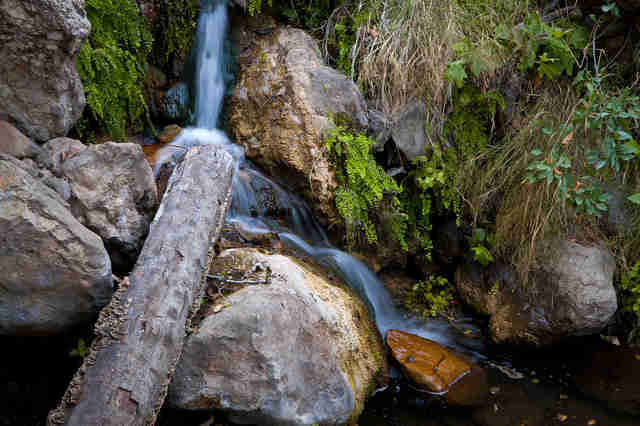 The approximately four-mile hike in a quiet, secluded canyon includes a handful of stream crossings, gorgeous greenery, and 700 feet of elevation gain -- all leading to a pretty 30-foot waterfall. 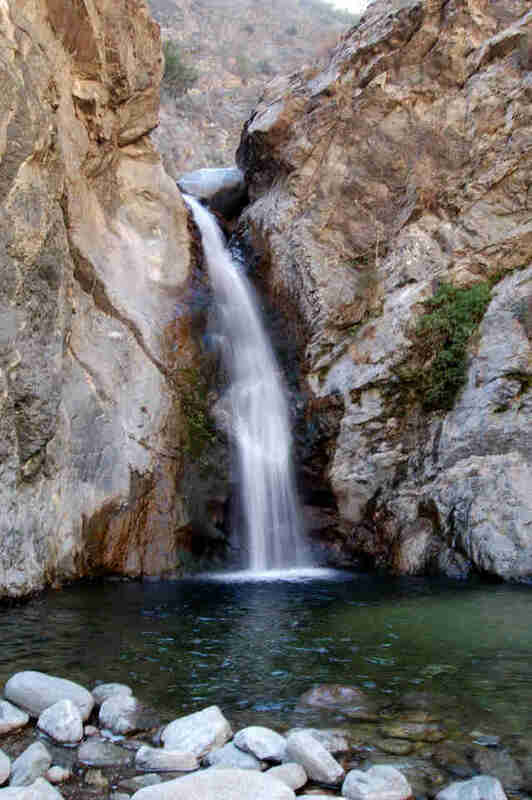 To see a waterfall without putting in a lot of work, try this hiker-approved excursion in the San Gabriel Mountains. Clocking in at just over three miles, the easy-in, easy-out path snakes across a photogenic stream lined with oak trees. Unlike other waterfall hikes, this one doesn’t quite lead you to the base (unless you’re a somewhat skilled climber), but enjoying the 50-foot tumbler from a short distance is good enough for most. Brush off your bouldering skills for this truly unique three-mile expedition, which takes you to a small, slightly hidden grotto surrounded by giant rocks. 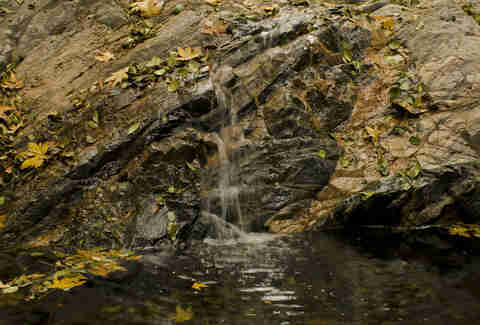 You’ll find a mini waterfall (best right after it rains) at the grotto’s base and -- as long as you’re willing to get a little dirty -- plenty of opportunities to explore. Tiffany Tse is a freelance contributor to Thrillist and always channels Indiana Jones when hiking. Follow her on Twitter: @twinksy.